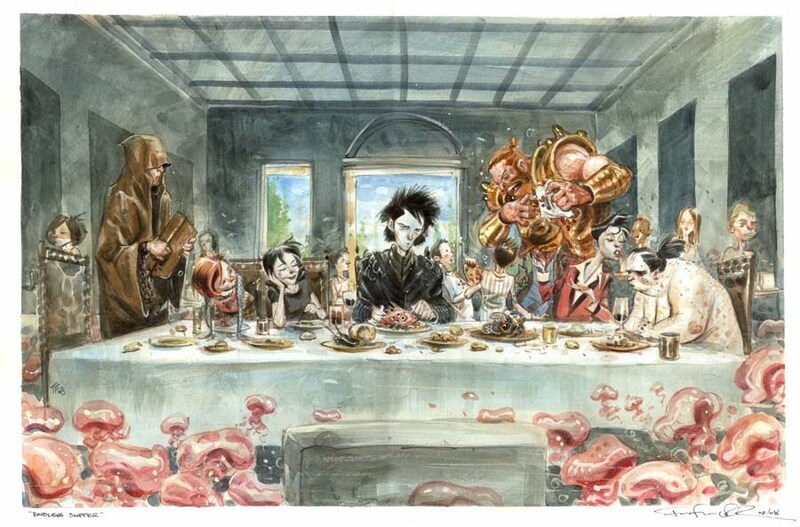 Fisrt up we got Tom Fowler's "The Endless at The Last Supper" which features Neil Gaiman's Sandman and all his magical brothers and sisters. Great stuff. Next up, we got Brian Stuckey's "The Last Breakfast". This is soooo cool. Wonderful! I love the 'The Endless' one! They are both brilliant, and I agree the Endless one edges it. Did something similar myself the other week, involving penguins! http://www.drunkduck.com/Lost_Tribe_of_Pen_GUin/index.php?p=787365 (not sure how to do the linky thing). AWESOME!!! Endless is of course my fave! So it appears we're doing SOMETHING right! Neil Gaiman...mutha effin' NEIL GAIMAN just posted a link to this CCD page via Twitter! "I love both of these Last Suppers. But I like the top one best, for obvious reasons http://bit.ly/euE1ye"
What a week it's been for us at CCD! Congrats, Mike!